In today's VETgirl online veterinary continuing education blog, we review feline urethral obstruction (FUO) in a 2-part series. FUO is a common disorder presenting to both the general practitioner and the emergency clinician. The majority of FUO patients present stable, with only mild dehydration or early onset of clinical signs. That said, approximately 12% of FUO cats present critically ill with azotemia and severe acid-base or electrolyte abnormalities (such as hyperkalemia, hypocalcemia, and metabolic acidosis) (Lee, 2003). FUO can result in dehydration and even hypovolemia due to significant fluid deficits. Azotemia can be seen within 24-48 hours; untreated, death can be seen within 60-75 hours (Lane, 2012). Profound electrolyte changes and azotemia can be seen as a result of a post-renal obstruction. Electrolyte changes can result in life-threatening arrhythmias and contribute to cardiovascular collapse. Prompt recognition and treatment must be initiated to ensure the best outcome in these critically ill patients. In this 2-part blog, we'll review signalment/etiology, clinical signs, physical examination findings and diagnostic work-up. Next week, we'll finish with overall treatment of the FUO patient! FUO is commonly seen in young, male, overweight cats (ranging in age from 2-6 years of age) (Reineke, 2013). Older cats (>10 years of age) presenting with FUO often have underlying disease such as urinary tract infections (seen in approximately 50% of cases) and underlying neoplasia (Reineke, 2013). FUO can occur as a result of urethral plugs (e.g., aggregates of crystals, WBC, RBC, protein, amorphous material, etc. ), calculi, spasm, urethral edema, or idiopathic causes. Studies have shown that the majority of cases of FUO are idiopathic (53%), while 29% are due to uroliths and the remaining 18% are due to plugs (Reineke, 2013). Baseline blood work should ideally include a minimum database including a packed cell volume (PCV), total solids (TS), BUN (Azostick), blood glucose, venous blood gas and electrolytes (specifically evaluating sodium, potassium, ionized calcium). A complete blood count (CBC), biochemistry panel, and urinalysis can be performed if financial limitations do not exist; with financial limitations, ideally, resources should be allocated towards treatment and life-saving care rather than diagnostics. In azotemic patients or those with profound electrolyte abnormalities, recheck blood work (e.g., electrolytes, renal panel, venous blood gas, etc.) should be performed at least daily, depending on the stability of the patient. A lead II electrocardiogram (ECG) should be performed ideally to evaluate for the presence of cardiac conduction abnormalities or arrhythmias, particularly in the bradycardiac cat (e.g., HR < 160 bpm). Abnormalities seen on ECG with hyperkalemia include spiked T waves (e.g., peaking and narrowing of the T wave), shortened QT intervals, widening of the QRS complex, absent P waves, prolonged P-R interview, S-T segment depression, bradycardia, and rarely, ventricular flutter, fibrillation, or asystole. Radiographs can be performed to look for the presence of cystic or urethral calculi. An ultrasound (e.g., FAST) may need to be performed to evaluate for the presence of uroabdomen, urinary masses, cystic calculi, etc. Unfortunately, this would not assess the urethral well, as small uroliths may be difficult to detect via ultrasound. Check out Part 2 in next week's VETgirl online veterinary continuing education blog! You can also check out our video on how to unblock cats here. Lee JA, Drobatz KJ. Characterization of the clinical characteristics, electrolytes, acid-base and renal parameters in male cats with urethral obstruction. J Vet Emerg Crit Care 2003;13(4): 227–33. Reineke EL. Feline urethral obstruction: Emergency treatment and stabilization. Western Veterinary Conference 2013, Proceedings. Lane IF. Common challenges in feline urethral obstruction. Western Veterinary Conference 2012, Proceedings. Francis BJ, Wells RJ, Rao S, et al. Retrospective study to characterize postobstructive diuresis in cats with urethral obstruction. J Feline Med Surg 2010;12:606-608. Drobatz KJ, Cole S. The influence of crystalloid type on acid-base and electrolyte status of cats with urethral obstruction. J Vet Emerg Crit Care 2008;18(4): 355–61. Cooper ES, Owens TJ, Chew DJ et al. 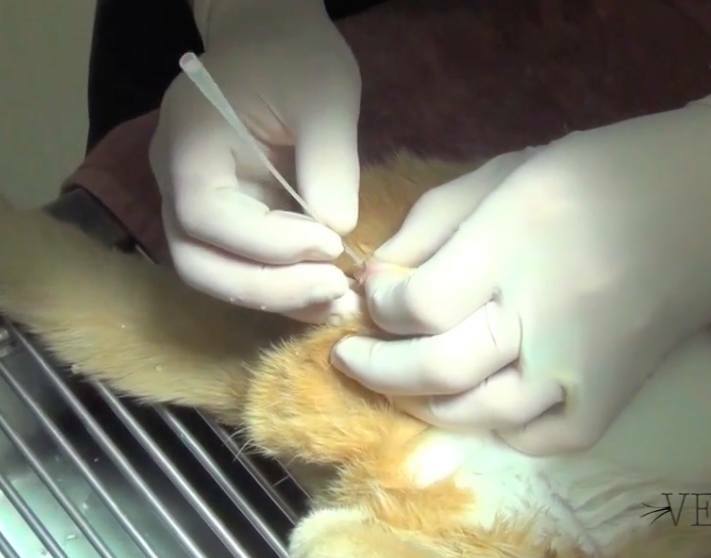 A protocol for managing urethral obstruction in male cats without urethral catheterization. JAVMA 2010;237(11):1261-1266. Hall J, Hall K, Powell L, Lulich J. Outcome of male cats managed for urethral obstruction with decompressive cystocentesis and urinary catheterization: 47 cats. JVECC 2015;25(2):256-262.